Lavish property featuring an infinity pool, barbecue pit, sun deck etc. Situated near Surin beach, Villa Baan Surin Sawan is a traditionally-designed holiday villa offering a relaxing and rejuvenating holiday experience to guests looking for some time out from the busy lives. While you lounge in the infinity pool or sunbathe on the deck, enjoy the remarkable view of the ocean, or simply swim up to the bar for a chilled drink. The interiors are marked by intricate Buddha statues, wall tapestries, traditional linen, and lavish bathrooms with Jacuzzi tubs! Ideal for friends and family, the villa is a sanctuary amidst natural foliage for a restful and tranquil vacation. The villa has four, well-appointed and furnished bedrooms, located on the upper floor with excellent view of the beach and the neighboring regions. The master bedroom is a lavish affair with hardwood flooring, glass walls, and a four-poster, king-sized bed. The en-suite bathroom even has a terrazzo bathtub for tranquil bathtime. Two bedrooms have king-sized beds, sofas, and a luxurious display of Thai artefacts as well to create a cozy space for guests to relax in. Each bedroom has an en-suite bathroom with a bathtub. The fourth bedroom is furnished with a double bed and features an en-suite bathroom. Each of the four bedrooms is air-conditioned. The luscious panoramic view from the 11-metre infinity pool is to die for, and this you can relish as much as you wish, right from sunrise to sunset! Lounge on the sun deck upon sun chairs, with a drink in hand or a good book, and simply ease up into holiday mode. There is abundant greenery, blue skies overhead, and a sprawling view of the island. There is a swim-up bar where you can get your drinks, a sala houses a sitting area for relaxation. An enchanting sitting corner with outdoor chairs, barbecue pit, and verdant gardens is the ideal spot for hanging out with loved ones. 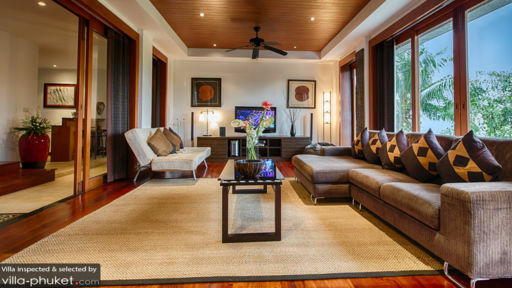 The interiors of Villa Baan Surin Sawan are rich with Thai artefacts, artwork, and designs. The walls are donned by selective artwork and hangings, there are Buddha statues around the rooms, vibrantly-colored cushions, and a high-soaring Thai ceiling for a complete look. The opulence is evident due to the wooden flooring and slate-walls. There are comfortable sofas and armchairs for resting, and glass walls ensure the room is flooded with natural light. A flat-screen TV is found along with comfy couches etc. Guests have the option of dining alfresco or indoors in a luxurious space assigned to a 10-seater dining table set against an abundantly green and picturesque view outdoors. Adjoining the dining area is the kitchen, fully-equipped and functional, complete with all modern amenities and appliances for your use. There is even a breakfast bar with bar-stools, ideal for quick bites. 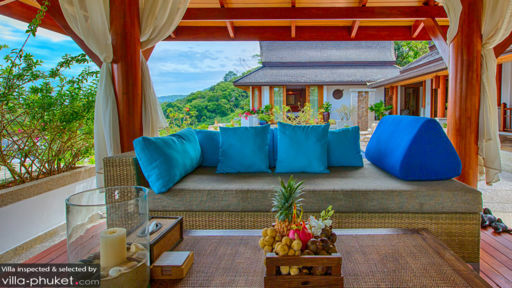 The staff at Villa Baan Surin Sawan is perceptive to your needs and will offer privacy when desired. They are locals, which is great if you need recommendations on where to go and what to see. The chef can prepare all your meals, however, at an additional cost for groceries and services. Housekeeping and management is taken care of by the staff, so you don’t have to deal with it! There is much to do around the villa near Surin beach including swimming, sunbathing, watersports, and heading out the beach clubs like Catch beach club for drinks to unwind in the evening. Explore Laem Singh beach where you can snorkel and discover an array of different marine creatures that you can interact with! The most beautiful villa - the owners have thought of everything. the villa was incredibly comfortable, super clean and had everything we needed. Noi the housekeeper looked after us beautifully - she was there when we needed her but gave us plenty of privacy the rest of the time. We didn't want to leave and would definitely love to go again. All other trips are going to pale in comparison now!! A beautiful, luxurious, romantic villa. I wish we could have stayed longer. The housekeeper was wonderful and we felt thoroughly pampered. Perfect location and great amenities. I promised myself I would write a short review just to say how wonderful our visit to Phuket was, made so largely due to the setting and the staff at Baan Surin Sawan. This villa is maintained to perfection. The staff, head by Pat, were always incredibly polite, curious and helpful. They even spent time playing games with our children to our delight. During our stay, we did not lift a finger - not to cook, wash, clean, etc. I don't remember ever feeling quite so relaxed and well looked after. The food was absolutely delicious. We will definitely be back! 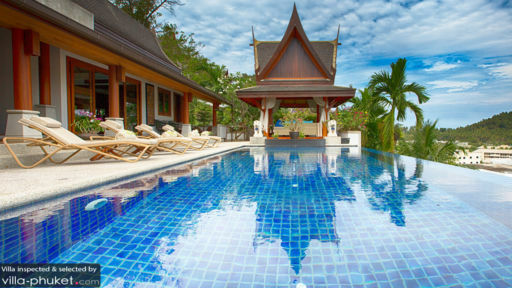 The residence is halfway from the airport to Patong 10 mins walk from Surin beach. The villa is set halfway up the hillside on the left hand side of the embankment near the Quarter residence. It is extremely well maintained and fitted throughout, as you walk in up the long flight of stairs you are treated to a fantastic view the pool offers a chance to fall asleep on a floating bed overlooking the jungle and Surin bay. Rooms and beds are well maintained, quiet and homely each with onsuite bathrooms. The kitchen has all modcons and we cooked a fantastic BBQ at the rear of the villa which helped make use of the dining room.